Yes, you heard me. Bison Chili. As in Buffalo. As in not a cow, or a steer but a real live (dead) buffalo stirred into the spicy goodness that is chili. Good chili, in fact. Healthy chili. 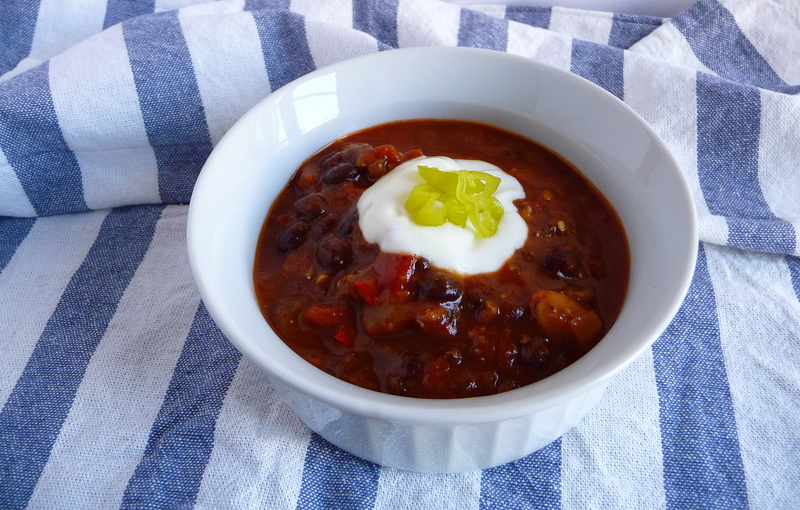 Chili that makes you feel warm and fuzzy. It starts like this: Lindsey and Daniel are meandering the farmer’s market in Hollywood this weekend, taking in the lovely bounty of winter citrus. And then, hark! A bison vendor. A real live grower of those ancient beasts. We had to buy some, especially since Daniel had never tried the wonders that are American Bison (Buffalo). We bought a pound of ground bison to whet our chops in some burgers. Good. Next, with about 1/3 lb. left I had to get creative on how to stretch such a small amount of meat for a meal for two. This chili was meant to be. First I sweated some veggies (onions, carrot, red bell pepper) in a big enamel pot until translucent. Threw in the rest of the ground bison and sauteed until almost cooked through. Seasoned with some chopped garlic, salt, pepper and chipotle peppers in adobo sauce that I had picked up at a Latino market nearby. As the aromatics worked their way into the meat and veggies I added chicken broth, black beans (from a can, I know, lazy!) white beans, chopped diced tomatoes, tomato paste and spices (oregano, paprika, cumin, coriander). Then I forgot about it. Well, not literally. I turned the pot down to a low simmer and went about my business, checking on it every 20 to 30 minutes to give it a stir. The chili worked its magic for about 3 hours, of which included maybe 20 minutes of hands-on attention. Topped with a little sour cream and some pepperocini (because I have an addiction to making my food as spicy as I can handle) it was a great, warm and healthy one pot meal. And then I got to take a pretty picture of it to share with you.